Managing time effectively and increasing productivity can be a daunting task both on a professional and a personal level. Managing your time and the time your team spends at work does not have to be overly complicated though. In fact there are just a few key principles that can drastically improve your productivity in the workplace without impacting your overall work flow. 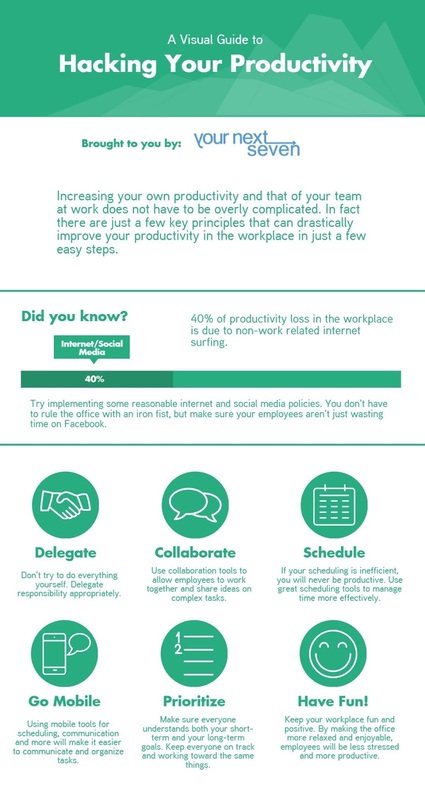 If you would like to become more productive quickly and easily, this infographic is for you. Did you know? - 40% of productivity loss in the workplace is due to non-work related internet surfing. You don't have to rule the office with an iron fist, but implementing reasonable policies regarding internet use and social media use in the office can increase office productivity drastically. You can't do everything - learn and teach others to delegate effectively. Your team is there for a reason - to handle tasks. Make sure that you are not trying to accomplish everything yourself and let employees do their jobs without unnecessary interference from you or your management team. Letting your employees collaborate and share ideas can drastically help increase productivity and morale. The more you contribute to effective collaboration in the office, the higher the collective intelligence of your team will be. This doesn't just go for employees - you need to schedule your own time effectively too. Using online employee scheduling sofware like Your Next Seven can help save you time and gives you a visual representation of when different employees are working. This can help give you a high-level perspective of potential and existing problems in your employee scheduling, making you aware of inefficiencies in your scheduling so that you can correct them. Particularly when it comes to employee scheduling and communication, make sure to use tools and software that can be accessed from mobile phones. This helps give employees and managers easier access to the tools and information they need to work effectively. It's pretty hard to score when you don't have a goal in place. Make sure that you have effectively outlined your current goals and priorities, and make sure that your team is fully aware of both your long-term and your short-term goals. That way everyone is on the same page and working toward the same goals. If you never let your employees relax a bit and have some fun they will become overloaded and stressed out, thereby reducing their productivity and the overall morale in the office. Make sure work gets done, but try to keep the collective attitude positive and relaxed. When employees feel happy and relaxed in the office, they are more likely to work hard without additional guidance from you or your managers. Even if you only implement a one or two of these productivity tips, you will see massive returns in the productivity and happiness of your employees. On their own, each of these ideas is useful and beneficial to any office. Put together though, they form a powerful plan for rapidly increasing both your own productivity, but the productivity of your entire team.